CNC Cutting Our facility to cut carbon fibre and fibreglass profiles with our CNC machine is becoming increasingly known as a leader in the industry due to the accuracy and premium finish we are proud to achieve with a range of composite materials. Set-up costs are surprisingly low. 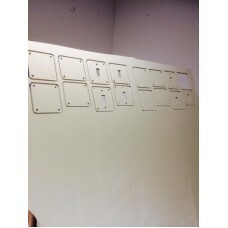 There are a variety of material stock sizes, and thicknesses, which you will hopefully find matches with your design, The pricing on these stock sizes includes setup and cutting of the parts from the stock material. If you require multiple products, from multiple sheets, or you have a non standard size, please feel free to email for a custom quotation to be created for you. Examples We have included a few examples of costs for parts to give you an idea of what you can achieve for your money. Once you have paid for the initial set-up/design, additional parts will simply be charged per hour of machining time (certain applications that require multiple tool changes or very fast turnaround times will have additional charges). 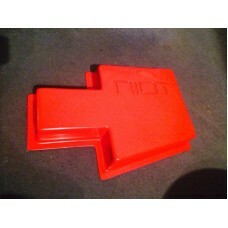 CNC example 1. This customer required USB panels and blank panels to be produced from a fibreglas..
Mould pattern production is made easy with CNC. This pattern was created to make a mould to produ..
CNC Example 3 Button Plate (steering Wheel) This particular product had already been desi.. 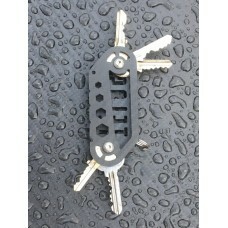 These Key Keepers are a great way to organise your keys, and they make a useful tool at the same tim..